AMD has today launched a quartet of Ryzen 2000-series CPUs that increase performance by around 10 per cent when evaluated against the previous-generation models of the same name. What they have in common is an AM4 form factor, with AMD promising enthusiasts that it will keep to that common mainstream socket until at least 2020. That said, the launch of a new series of CPUs is usually reason enough to release a new chipset. So, without further ado, enter the X470. This at-a-glance table shows the five AM4-supporting chipsets currently available. Let's not beat around the bush. X470 is barely any different to existing X370. AMD says that it has worked with chipset builder ASMedia to reduce idle and load chipset power by around 20 per cent, though it is still on the same process. Other improvements include better power regulation that is supposed to come into play when 2nd Gen Ryzen chips are run at higher speeds, especially when overclocked, and a couple of new technologies that are artificially segmented for X470. The first feature is Precision Boost Overdrive, which is to be implemented at a later date, and StoreMi. StoreMi is now the AMD name for a storage-amalgamating technology that is also known as Enmotus FuzeDrive. The purpose is to use all of your storage subsystem as one drive, moving the most commonly-used data to the fastest drive. The process is invisible to the user, handled by software, so if you upgrade a PC featuring a 1TB spinning drive by adding an SSD, the software will automatically begin using the SSD for loading. No OS reinstall is required, you can add multiple drives, and, in theory, it seems like a good idea. The software will be free for X470 and likely cost $20 for other Ryzen-supporting chipsets. It makes sense for anyone contemplating a 2nd Gen Ryzen chip to look at X470, so it's no surprise that motherboard vendors are ready and waiting with multiple models. 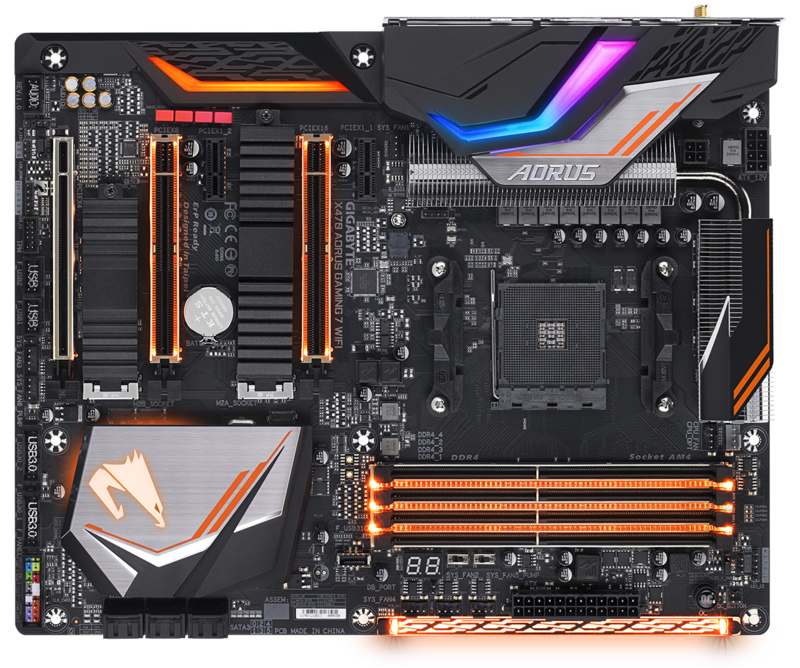 The Gaming 7 Wifi is one of three new Aorus X470 boards with others being Gaming 5 Wifi and Ultra Gaming. The 7 stands alone in terms of electrical specification as it has a 10+2-phase digital CPU power supply while the cheaper pair make do with 8+3. Having lots of phases is all well and good but they need to be cooled adequately. 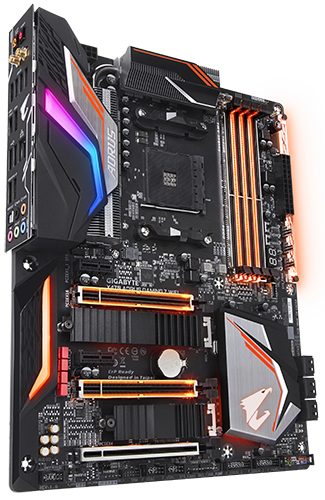 Aorus takes this seriously by having two impressive direct-touch heatsinks connected via a heatpipe. Unlike previous versions that feature largely hollow sections, there's a veritable fin party going on here. What's more, they're properly screwed in rather than attached via plastic pushpins. There's significant heft to the board, too, and it's down to a small but significant base plate that the heatsinks screw into. Mounting big coolers is straightforward and there's enough room near the DIMM slots to add tall memory without fouling. Having a x1 PCIe slot before the main x16 is also useful because it aids larger coolers. There's still a 3cm gap between a vertical-orientation Noctua DH15 and our test GeForce GTX 1080 Ti graphics card. RGB and strengthening slots remain big themes. There's even a swappable overlay on the near side, and enterprising enthusiasts can print their own overlays in the name of personalisation. If that's not enough, the board features two digital LED headers, two RGBW and one RGB. The effects are controlled either in the BIOS or via the RGB Fusion app. We'd prefer the main CPU fan header to be located nearer the middle as such a location would help if the board is used with a thick radiator that will inevitably block the header off in smaller chassis. 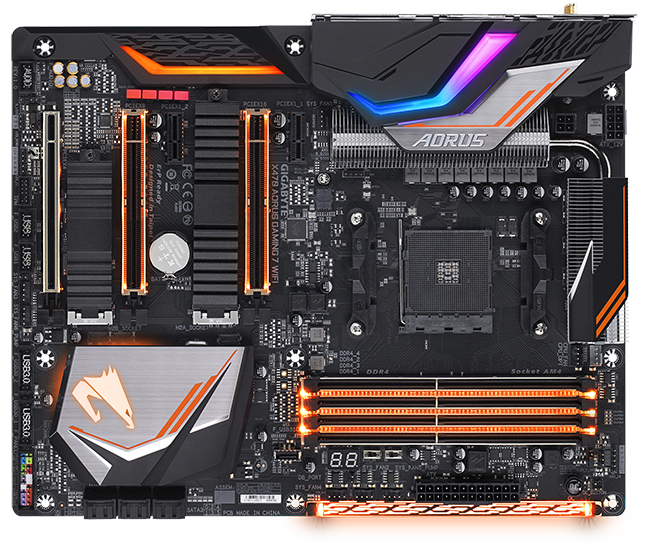 Aorus does a decent job of including the various overclocking tools without cramping this standard ATX motherboard. The debug LED is handy, temperature sensors are too, dual BIOSes is now the standard (with a switch to select between them), the OC button makes for easy overclocking, and there are proper buttons for power and clear CMOS on the I/O panel that's worth a specific mention later. The entire X470 range also has a USB 3.1 Type-C header suitable for newer chassis. This board is a case of throwing as much as you can and letting the enthusiast decide what they want to use. There are three watercooling-specific fan headers, and their sensible location means you can install a radiator pretty much anywhere and not worry about untidy cabling. The firmware features a fan-stop technology whereby any fan header can be stopped at a temperature of your choosing. Handy for those whose PCs remain idling most of the day. The two primary x16 PCIe slots are connected to the CPU and offer the choice of either single x16 or dual x8 in CrossFire or SLI configurations. Dual M.2 slots are provided - the upper taking in drives up to 110mm long and the lower 80mm. NVMe RAID is supported, or if you only have a SATA-based M.2 drive then it can be paired with a 2.5in SATA for less-impressive RAID. There is another M.2 slot (Type-E) that's hidden by the massive hunk of plastic on the left-hand side. 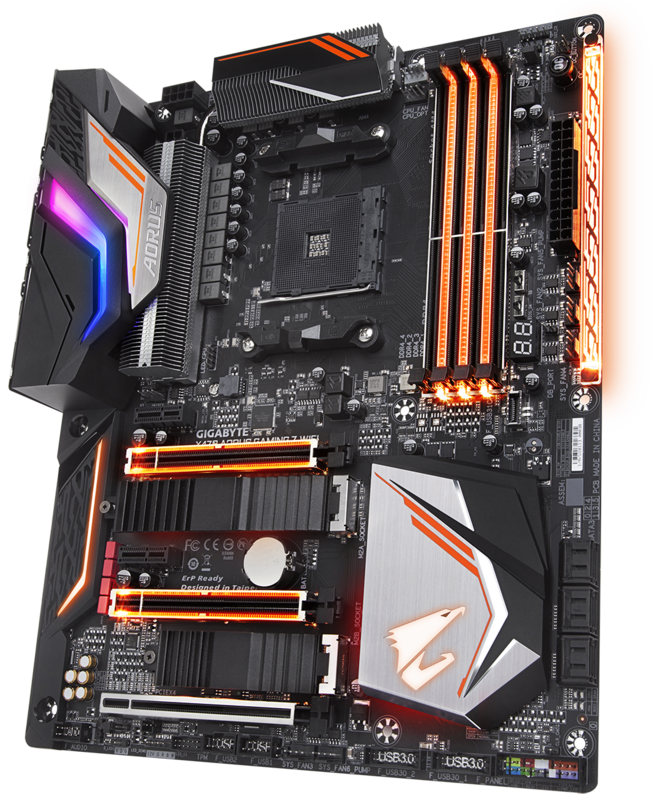 Speaking of hidden, this time under the LED lighting on the left, Aorus uses a high-end audio solution comprising the Realtek ALC1220-VB codec and ESS Sabre 9018Q2C DAC backed by premium capacitors. Laying everything out like this translates to no blocking-off of any ports with big graphics cards, and there's plenty of room between the slots. 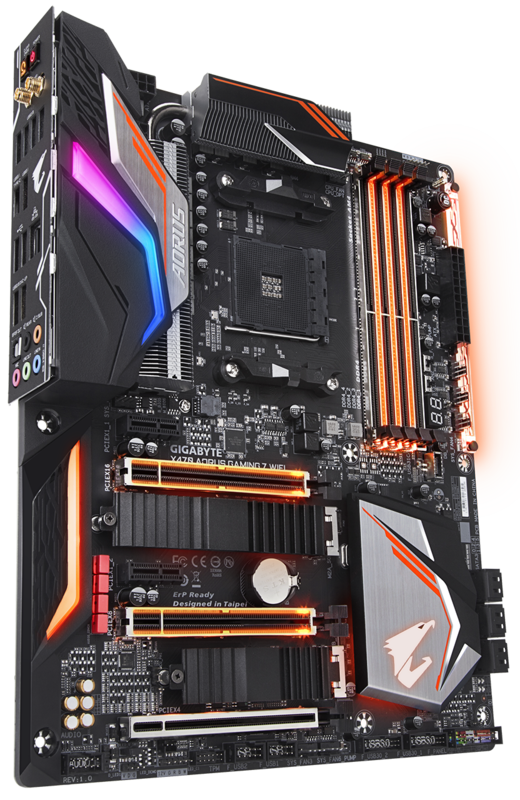 The X470 chipset powers the lowest PCIe x16 slot and the two x1. That lump of plastic is an integrated I/O shield that we're already fans of. It gives the board a suitably premium feel. Underneath is that Type-E M.2 slot populated by the latest Intel Wireless controller (9260) offering a potential 1,733Mbps throughput. 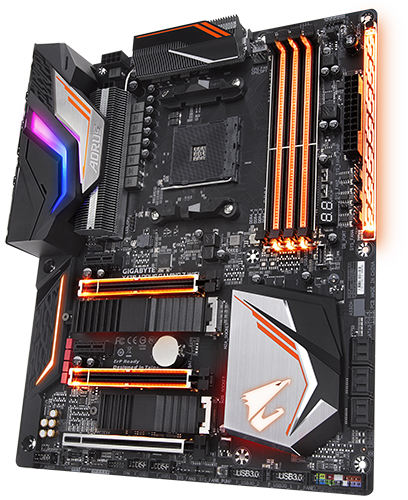 It's good to see Aorus jump on the fastest-available hardware. The same card also carries Bluetooth 5 support, as well. The rear is home to the aforementioned buttons, six USB 3.1 Gen 1 ports, one USB 3.1 Gen 2 Type-C, one USB 3.1 Gen 2 Type-A (the red above the Type-C), two USB 2.0, Gigabit LAN, and various audio ports. Firmware, meanwhile, remains largely based on the simple, lean version present on previous boards. We'd like it if, after making changes, the firmware would let you know the sum of those changes, a la Asus, rather than simply reboot. It's comforting to know exactly what you're changing if tweaking a bunch of settings. Maybe it's just us, but the mouse cursor moves ever so slowly across the firmware GUI - we had to lift and move several times to cover the span of the screen. On the plus side, putting everything on auto for a Ryzen 7 2700X results in the board running everything to specification without any behind-the-scenes auto-overclocking. Fan control is the remit of Smart Fan 5 which can auto-detect the type of fan and and provide a five-point draggable fan curve for custom speeds. Overall, the simple BIOS does the job but, for yours truly at least, lacks the polish of the Asus variant.